How can I help you save Red Rocks? Our twitter tagline says “Encouraging great concerts in a great place to be great neighbors– sustainable and respectful.” That pretty much says it all. Yes, sustainable has gotten to be an overused buzzword lately, but it’s the best word we have. We question whether the rapid increase in number of concerts* just in the last few years and the related impacts on the Park are sustainable. Our primary concern now, however, is the noise generated by concerts, which has increased dramatically in recent years as well. 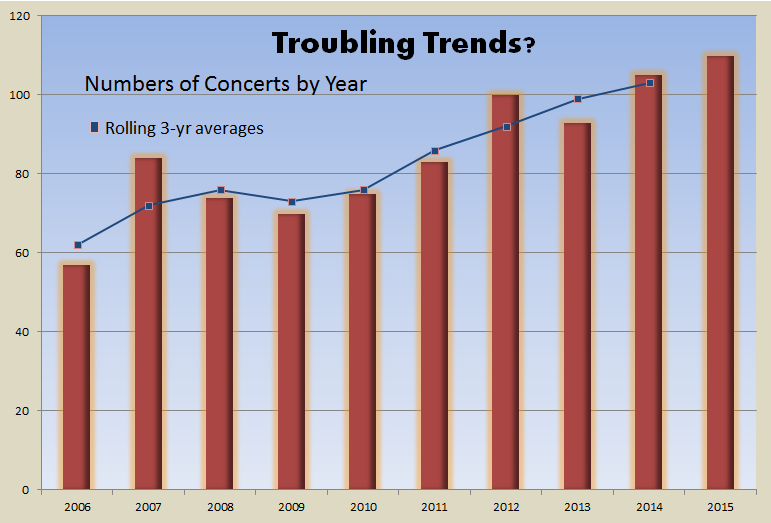 Concert numbers vary by year, but the 3-year rolling averages show general upward trend. Data from Westword.com and RedRocksOnline concert archive. Please understand that most of us have lived in the Red Rocks/Morrison area for many years. We have always heard the concerts, but until about 2010, we have had little or no reason to complain. Only rarely did they exceed levels that we could tolerate at least for a few evenings a year. We welcomed Red Rocks as a neighbor. Those of us who live in the area have enjoyed Red Rocks Park for a variety of reasons. We hike there and walk our dogs there. We enjoy showing the Park off to out-of-town visitors. We are lucky to be able to appreciate the incredible scenery year-round. We believe Red Rocks is far more than a popular concert venue. Red Rocks is an important and valuable PARK, soon, we understand, to become a National Historic Landmark. But its park values are being slowly eroded by its excessive use for concerts that generate revenues for the City of Denver. We believe those revenues have become so important to decision-makers that the Park’s other values, including its scenery, rich history, natural landscapes, vegetation, and wildlife are being excluded or impaired. When we say “Save Red Rocks,” we are suggesting that, unless concerts become sustainable and respectful of those other values, everything else we love about the Park will end up being sacrificed to the increasingly dominant use as a concert venue. So when we say Save Red Rocks, we are working to Save Red Rocks as a Park, not as a night club. * See Westword, which notes there were 57 shows in 2006 and 83 in 2011, for a 31% increase. From 2009 to 2014, concerts increased 50% (70 to 105). It’s only April, and already there are 110 concerts on the schedule for 2015. At this time last year, there were only 85 scheduled concerts. More noise, more often. We’ve caught up on back posts, and are ready to roll for this season. New restrictions are in effect, but early indications are not encouraging. We’re keeping open minds and hoping for the best. We know you’re inspired to play along as we track concerts this year. Make it easy—download the 2015 schedule pdf here. Violations can result in performers exclusion from Red Rocks. More detail studies to fine tune the noise restrictions for 2016. Weather station to be added to the study. There would have been a total of 368 noise level violations, and 23 ending time violations, resulting in a total of $3,910,000 in fines. This is a clue that tells us how bad the noise was last year, but not why. Now we know that the actual data show performers were regularly hitting Low Frequency (dB1) levels greater than 130 BEFORE the restrictions went into effect (only during the last half hour). Many concerts reached peak and ended before they were even covered by the 2014 restrictions. For example the data show Bassnectar peaked at 138 dB1 before ending at 11:45 on a weekend. Added later: Here’s Westword’s summary of the new regulations. If you’d like to rate this concert, here’s the scale we used last year: we are not posting the formal polls this year. Please add further comments below if you wish.